How can we spread the unplugged word? Harold Wilson, former British Prime Minster, once said a week is a long time in politics. If that’s true, then a decade (and teaching unplugged was named, if not born, over a decade ago) is a much longer time. How far have its ideas established roots in mainstream ELT, or mainstream language education? Perhaps unplugged approaches to teaching are a bit like the UK Green Party – handy to have on the opposition benches, but not well-suited to government? Coincidentally though, Brighton – home of the last IATEFL conference – just elected the UK’s first Green Local Council – should ELT also dare to be different? Perhaps dogme is by its nature a minority sport – or perhaps promoting it smacks too much of missionary work and all its unappealing connotations? Fair enough, but on the other hand, if we think it is working for us and our learners, wouldn’t the world be a better place if there was a bit more dogme-ness around? And you don’t enter the mainstream – as the UK Green Party must have realised – by sitting at home and keeping quiet: you do it by getting out and knocking on doors! There are two aspects to this: firstly the question of how to encourage more ELT teachers, school managers and institutions to take a more unplugged attitude to things. Second, it means making the ideas behind unplugged teaching open and accessible to teachers of other languages. when observing colleagues, could you discuss any ideas you have for their doing more with less? Could you offer to run workshops for colleagues who are interested but want some “training”? Going unplugged en francais, auf Deutsch, etc. Many ELT dogme teachers either speak another language or have that language as their L1. 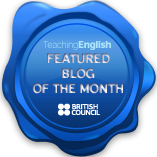 Why not write about your unplugged teaching in both languages? If your school teaches in more than one language, are you sure that all your cross-departmental colleagues know about anything unplugged-related going on? Could you make contact with local other language teachers’ associations and find out if there is awareness/interest in unplugged teaching? If there is, could you suggest organising a workshop? If they don’t have anyone to do it, why not offer to do it yourself? – Self is The Dogmeist! These are just questions to elicit ideas, and ideas are just hot air unless someone takes them up as a cause. So, if you by chance are also interested in sharing unplugged principles and practice in your local area, then form a working group on Saturday 21 May in Barcelona and get it started – and if this is the last thing in the world you want to spend Saturday doing, then come along and do whatever you are passionate about: Open Space means you set the agenda! Another good one Anthony. Nice ideas for “unplugged outreach”. I do most anyway, and I have been asked to “train” colleagues in other schools in the organisation, on the back of the IATEFL symposium! YAY! Spread the good news,Candy 😉 Glad to hear your organisation is supporting you that way! Am sitting and pondering how on earth I’m going to adhere to the aviation industries ridiculous limitations on “liquids in hand luggage” and still be able to bring, toothpaste, deodorant, face cream and a bit make up all in 100ml! Yikes! Anyway, I’ve been banging on, then demonstrating, banging on, then demonstrating conversation driven and emergent language for some time now at our school it’s kind of become a given with some of the teachers. So we have the culture. We have a huge German staff at our schools, and the head of German is very interested in communicative teaching. Next step, when time allows, is to start dogme workshops for the German teachers. ETAS has been exposed to me going on about emergent language in a few different workshops – and of course as Teacher Development Chair this year – I’m delighted we have a dogme presence (that would be you Anthony) at the conference this year – SIG Day ZUG, Switzerland, September 17th. Don’t miss it!! It’s even possible to bring in elements of dogme (working with emergent language and conversation driven) at publishers conferences, if you select an appropriate book to link in. Looking forward to tomorrow, I’ll be listening to the theme tune from Hawaii 5.0 on the way over! Sounds like Switzerland is Dogme Heaven – so the Alps are a good place to unplug as well as unwind! Thanks for the handy cosmetic tips Anthony! Will pop into Co-op during lunch break tomorrow and look for Weleda deodorant. Travelling “materials light” is always a bit of a challenge for me! !